Biking is one of the best ways to keep your body healthy. Giving your body the constant motion, stretching, and overall exercise is a great way to keep in shape no matter regardless of what time of year it is. However, if you’re not careful, you can damage your body. In fact, hurting ligaments and other tendons is something that can happen from biking if you do it frequently and without much care. There are ways that you can take care of this, though—maintaining a diet that is healthy can be a strong method in fighting the inflammation that increases your chances of hurting yourself while biking. 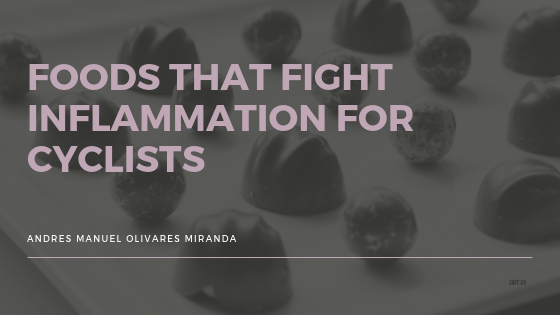 Because of how many people aren’t familiar with the foods you can eat to decrease your body’s inflammation, here are a list of three foods that decrease inflammation. No, this is not an error, chocolate can help decrease inflammation. However, this doesn’t mean you should start buying Hershey bars in bulk just yet; natural, dark chocolate is the way with which you can stay healthy, with it containing many different types of antioxidants and similar ingredients that help your body reduce overall inflammation. To be sure that you’re consuming the right amount of dark chocolate, make sure the bar that you feast on is a minimum of 70% cocoa. Regularly eating oranges can be a great way for you to decrease any pain resulting from inflammation, with some studies even concluding that those who had taken an orange peel extract every day can experience decreased pain symptoms within two months. Oranges can also give you other health benefits such as more vitamin C! By far the best way you can decrease inflammation in your body is eating fish. The best fish you can do this with is salmon, as the Omega-3 you can find in the fish aids your body in remarkable ways. If you’re not able to eat fish regularly, even taking fish oil can be an excellent way for you to get the support you need. Want more tips on how to decrease inflammation? Check out this list of 2 more additional foods you can eat for more information!